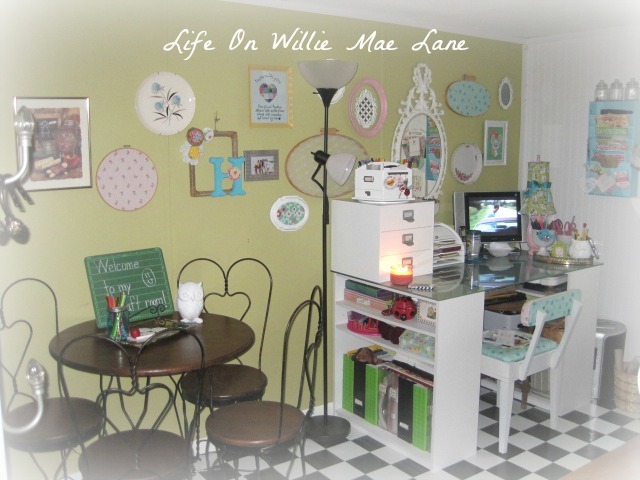 Life On Willie Mae Lane: Craft Room Redo.....Take 3! Hello and Happy Saturday everyone! I have missed posting the past couple days, but I have been busy as a bee! I don' know why (since I have a million and one other things I NEED to do), but I got a wild hair and decided that my craft room needed to be slightly rearranged and reorganized. Now, the room was already a mess (no I didn't take before pictures) and then I proceeded to take most of my junk stuff off the shelves and find new homes for it, so the room looked like tornado had hit for a while! I spent the better part of two days working in there, but I am really pleased with how it turned out. You can see some before photos here and here. This is the view from the door. The biggest reason for the rearrange was to make more room for the ice cream table and chair set you see below. I got a great deal on this set earlier in the year. You can read about it here. Here's a little welcome sign for you. I decided to put a little back to school themed vignette on the table since I am in school mode and have been busily preparing for my new kindergarten classroom. I just love my aqua blue ball jars I ordered from Amazon a while back. Here is my desk....nothing really changed here....except you can now see the top of the desk! lol Oh...I did add that pink frame around the other frame at the top left of the photo. This is the view from the closet side of the room. One of the big changes came in here. I moved one of my white shelf units to this end of the room and created an L shape in the corner to create another closet type area. The shelf had previously been on the wall where the ice cream set is now and it sat in front of it. This made it hard to get to anything on the shelf. 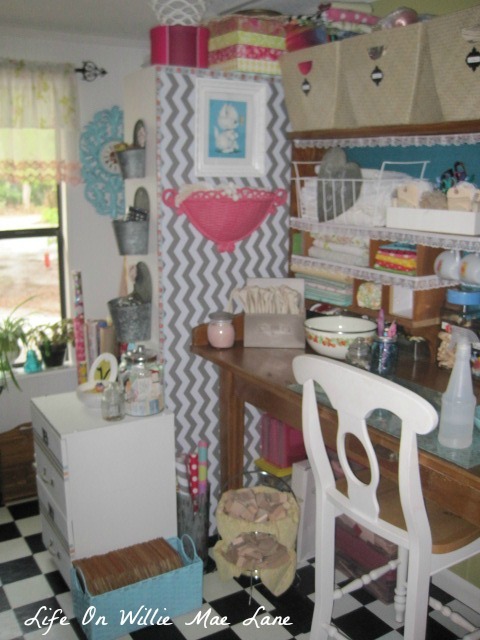 You can see the back of the shelf here covered in chevron drawer liner I ordered from Amazon a while back. 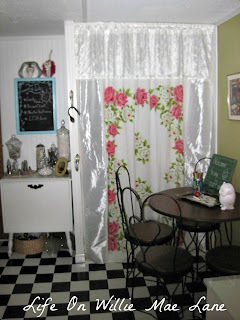 It makes a wall which I love because it gave me more storage areas. 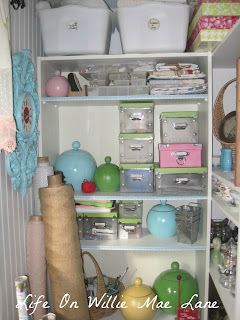 Here is a picture of the two shelves together. The one facing holds lots of craft items. I want to label the canisters but am still deciding how to do that. I thought about painting them all with chalkboard paint but can't decide. I guess I could make tags to hang from the knobs. What do you think? They hold random things like batteries, coin wrappers, old prescription bottles (yes, I have a plan for them), and a couple of them are still empty! Here is another view. 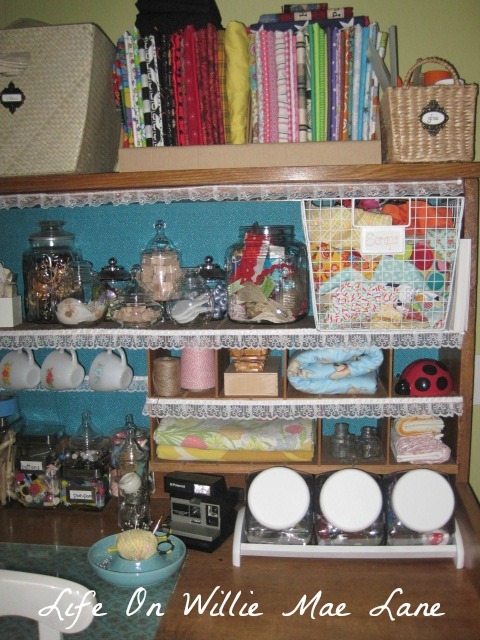 The shelf on the right holds all the things I am EVENTUALLY going to get around to listing in my ETSY shop. That is extremely time consuming, but I need to do it. I have lots of things to list! Anywho, on the end of the shelf are some galvanized containers I ordered from Pick Your Plum a few months ago and had not put to use...until now. 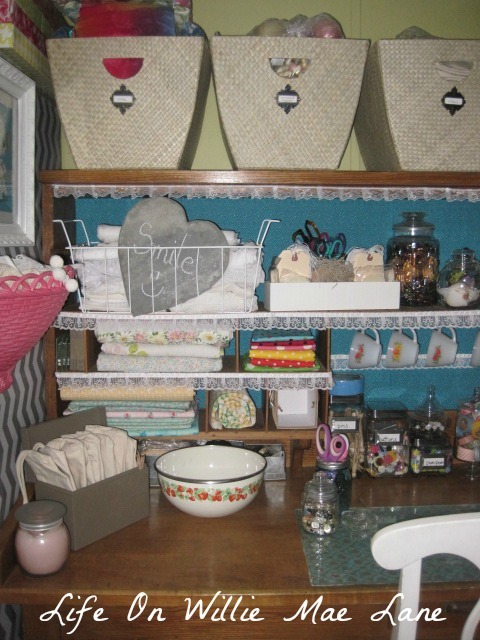 One thing I did in this reorganization project was to use lots of things I just had sitting around. In this view you can see the lower shelves and my basket of wrapping paper. Here's another view with my file cabinet I redid a while back. 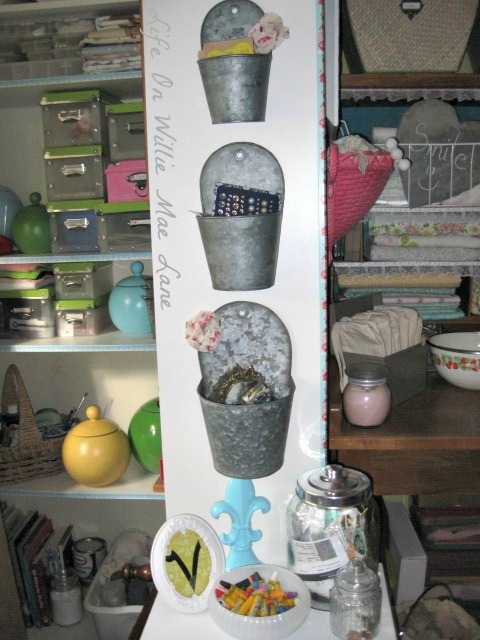 Here is the side of the shelf. 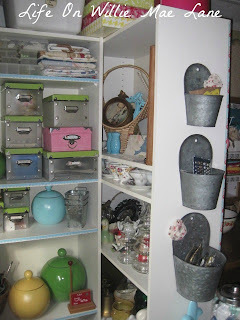 You can see here how it divides the space and creates a little corner storage area. I had to get really creative in my small room. I have several pieces of furniture in here. The top of the file cabinet holds my ticket jar and a few other things. I have kept every ticket from every event , movie, play, concert, etc, that I have ever attended since I was 17 years old (when I started dating my hubby). I love the new "wall" space the back of the shelf provides. 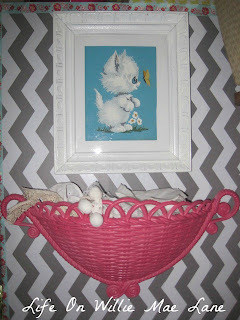 I hung my recently thrifted and painted watermelon pink wall basket here as well as a cute little vintage painting taken from the wall above my white desk. I trimmed the chevron "wall" with a roll of Martha Stewart craft tape I ordered from Amazon. Here is the left side of my huge desk. I bought this from the post office where I used to work as a mail carrier for $50. 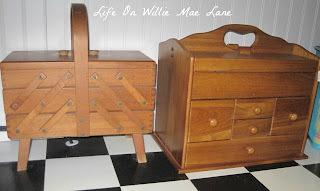 It is solid wood and was built in the fifties.....or maybe it was the thirties. I really can't recall but it is stenciled on the underside of the desk. It was a mail sorting case. It used to have 4 shelves of little slots to sort mail in. You can see some of the slots although I have removed most of them and left large spaces. I want to do more with this piece someday, but I'm happy with it for now. For those of you who follow me, you might recognize several recent thrifty finds displayed here on my desk. Pretty much everything you see is a thrifty find though. There are a few things I purchased new, but very few! Here's the right side of the desk. My jute and baker's twine. 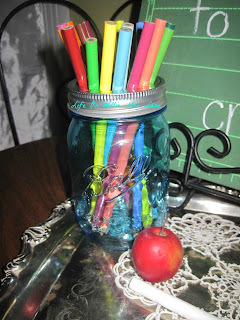 I really need to order some in different colors...I love baker's twine! I bought this sweet little aqua blue dish a while back at a thrift and couldn't figure out just what to do with it...but inspiration struck while I was working and it hit me that it would be perfect to hold a pin cushion and pins! 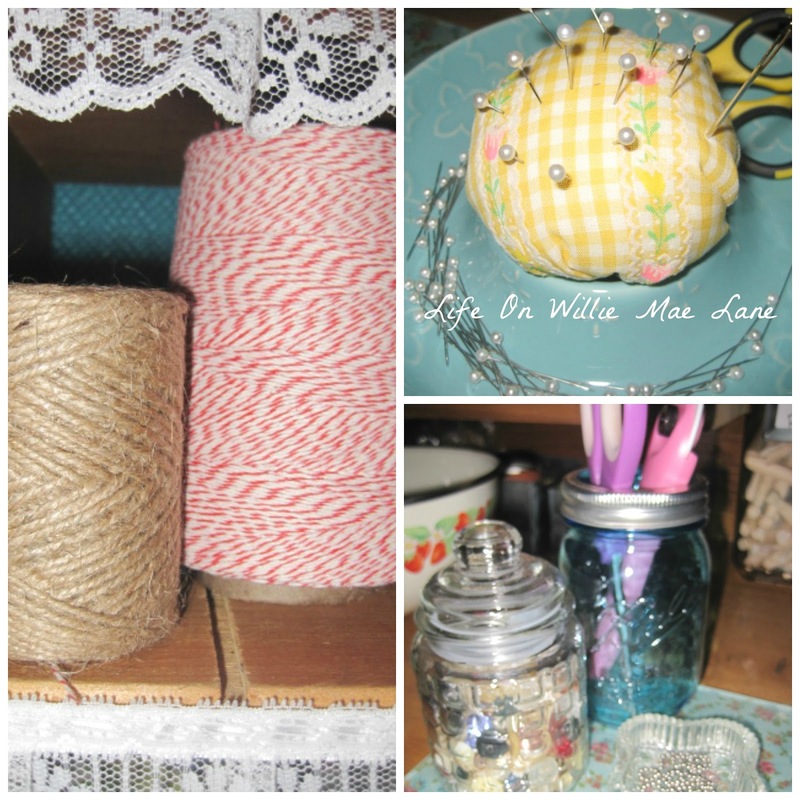 Love it...:) One of my aqua blue ball jars holds my fabric scissors and rotary cutter. The little jar beside it holds buttons that belonged to my grandpa. The freezer basket holds white fabrics and the vintage file box holds canvas wrist bags that I am eventually going to decorate and sell. Here's a close up here of the craft tape I trimmed the chevron wall with. It's kind of blurry but you can see the pretty colors in it. 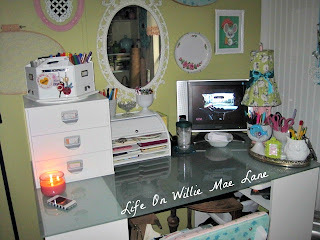 The strawberry bowl on the desk is to hold scraps and trash as I create! 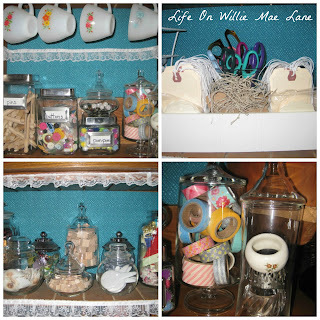 Notice the little Fire King cups from my trip to Amish country I hung! There is a tray full of tags, and tons of apothecary jars full of goodies! Here's my color coordinated fabrics. This wouldn't hold all my fabric, so it's spread around and about. I love my big baskets (of course, a thrifty find). 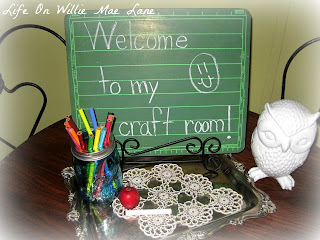 I labeled them with Tim Holtz brass plate label holders. I love Tim Hotlz products. My glue basket and fabric scrap basket are in this photo too. This next to last photo (yes, I'm almost through rambling) shows some floor storage. This is on the floor by my file cabinet. You can see in one of the photos above. The blue basket holds wood slats...the ones that used to be in the mail sorting case. I am going to find a use for them some day! 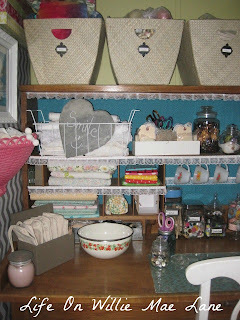 The two tiered basket holds wood blocks of all shapes and sizes, and the tall vase holds small rolls of wrapping paper and shelf liner. The next pic shows old ink bottles my Granny Valentine dug up on some of her adventures. 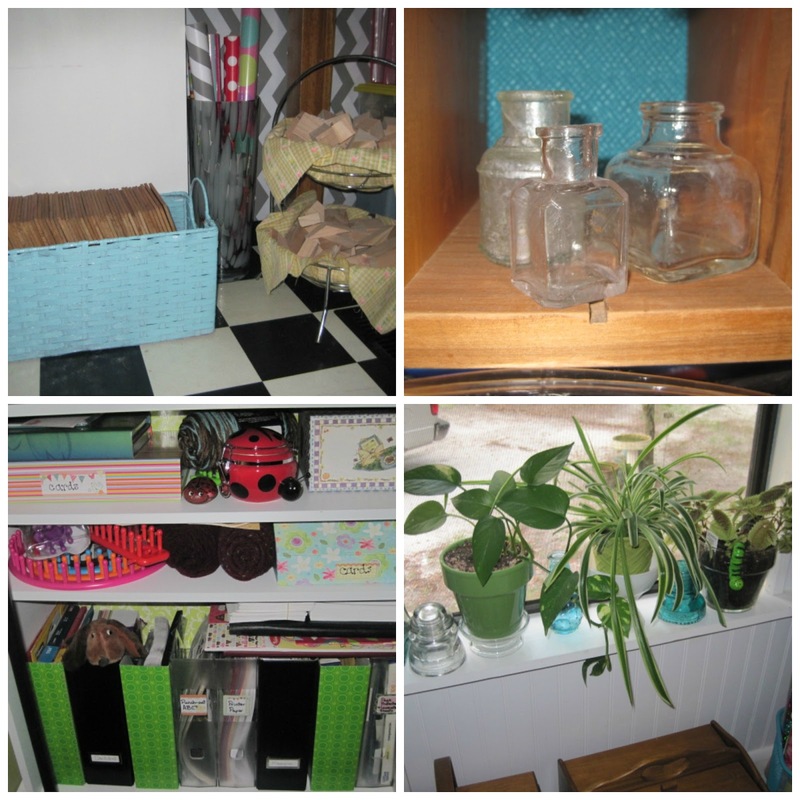 The bottom left photo is one of the shelves that hold the glass top desk. 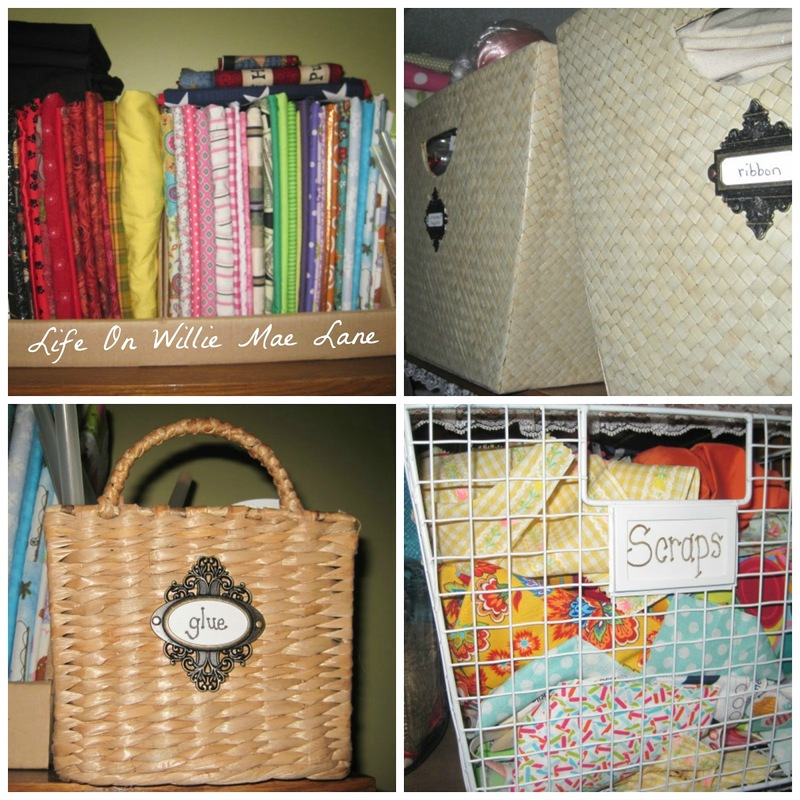 It holds stationery and cards, a variety of paper, stickers, and office supplies, and my yarn and looms. The bottom right is my plant shelf in the window. Below the window is my sewing chest and another chest I bought for a couple dollars a few months back. It was a jewelry box, but I repurposed it and am using it for a toolbox. It now holds all my tools, picture hanging supplies, screws & nails, a variety of hardware, and a few other miscellaneous items. Don't know why I didn't think of this before, it works perfectly for a toolbox! Here's they are together. They make a cute couple don't they...lol! Sorry that was a long post, but I wanted to share what I've been up to. I have some more things to share but they will have to wait! Hope you have a blessed evening. 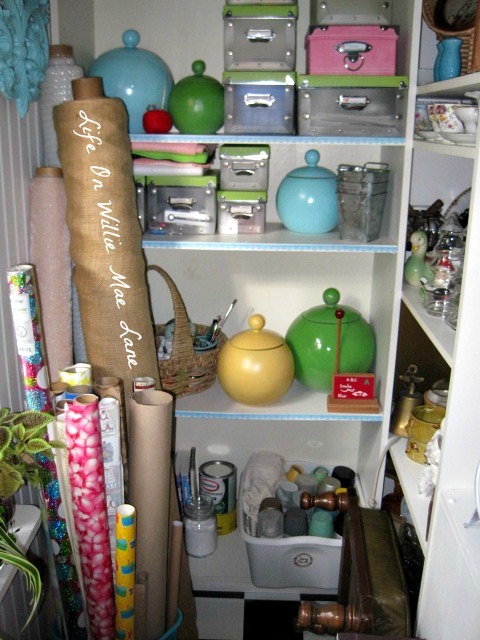 Hi Vicky, Boy your craft room looks like you have anything you might need.Very cute and organized. 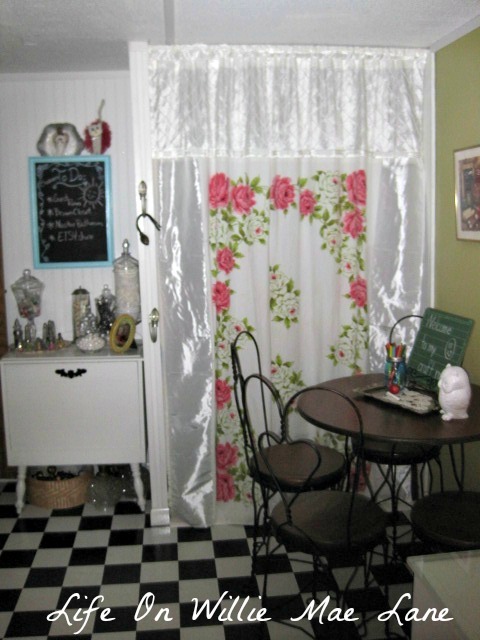 I have been in my spare room/craft/sewing room for the last two days also. See told ya we were family! My daughter lives in Pensacola. I sure miss her! I love how your storage pieces and work surfaces are personal to you like "old friends". Mine are old friends to me too. I'll have to visit your etsy shop and see what you have in there. I wish I got as much done as you do! 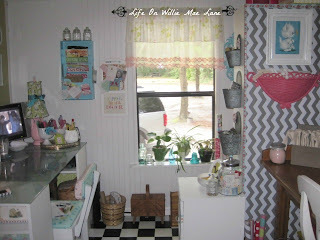 I LOVE your black and white checker board floor too! Wow! You have been so industrious. Love all the changes and I know you'll be so much more creative in these surroundings! It looks great! 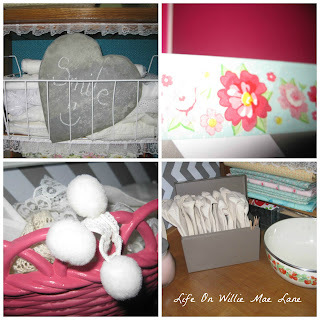 I'm trying to carve out a bit of crafting space in my spare room. Still working on it but hope to have a place ot work soon! Wow, I love how you've redone your craft room, I could probably stand in there forever just discovering new things!! 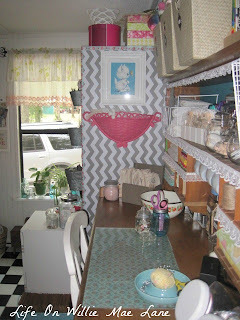 I recently moved my craft room from upstairs to the basement so I know what you mean about making a huge mess before you get everything organized. I'll be showing mine one of these days! ;o) I think that you and I are a lot alike in some ways... I save things like pill bottles, toilet paper rolls, etc. for crafting too! Very nice space...no wonder you are so creative! So many nice things and perfectly arranged!